Anakin's dark deeds as Darth Vader don't come without consequence. Exceptional Star Wars art from Jerry VanderStelt. This masterful giclee print is limited to only 150 pieces. Features images of Padme Amidala and Obi-Wan Kenobi with Darth Vader. Order yours and bask in the consequences! 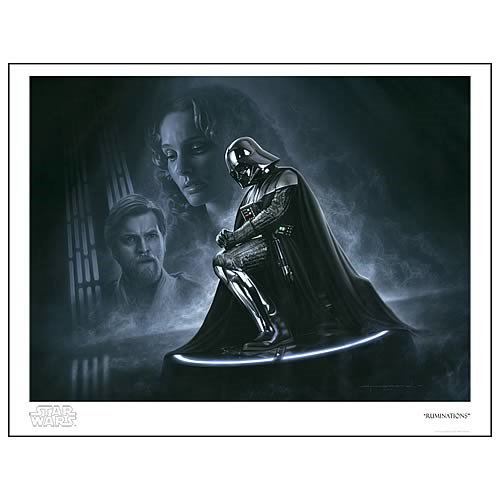 Anakin Skywalker's dark deeds as Darth Vader don't come without consequence, and this dramatic Star Wars Ruminations Paper Giclee Print shows it. The exceptional work of art features ghostly images of Padme Amidala and Obi-Wan Kenobi with Darth Vader in the foreground. From artist Jerry VanderStelt, this masterful piece measures 22-inches wide x 17-inches tall, is limited to only 150 hand-numbered pieces worldwide, and comes with a certificate of authenticity. Order yours and bask in the consequences!